Get ready for Question Period, our second infamous trivia night! Come to the Drake Hotel on December 2, 2014 for a good food, good drink, great cause party. Comedic geniuses Hannah Cheesman & Kristian Bruun will test your knowledge of the factual and the inane, and of course, into every trivia night a little blood must fall with some period-centric questions. You’ll be having so much fun that you will barely notice you are supporting MNP’s groundbreaking work in January 2015: all proceeds will help provide 1,000 girls in Cameroon with menstrual health supplies and information. Plus – there are prizes to be won! You can sign up your team of four players or sign up as an individual (do you trust our matchmaking skills?!). Name your team (and yes, there are points for wit and cleverness). Doors open at 7 pm so we can roll up our sleeves and get serious about trivia at 8 pm. Tickets are $15 per person or $60 for a team of four. 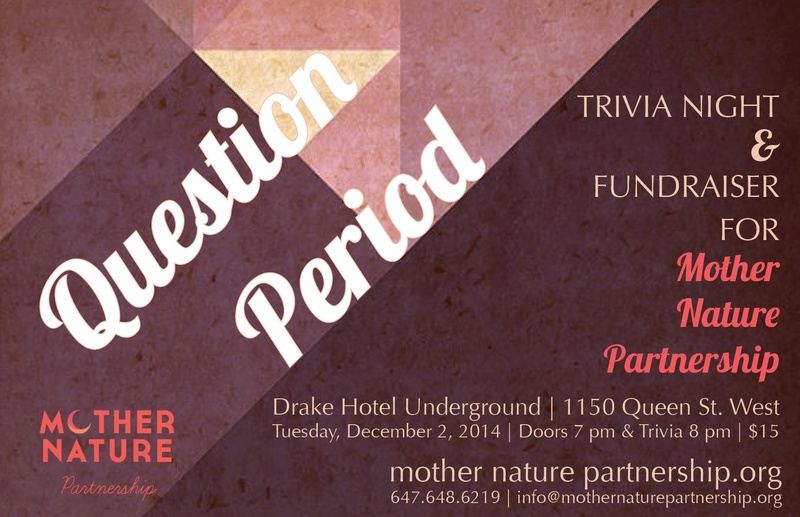 See you at #QuestionPeriodTO. SIGN UP FOR QUESTION PERIOD!